The Japanese government’s decision to increase the maximum yearly radiation exposure limit for Fukushima school children by a factor of 20 – from 1 to 20 millisieverts – continues to spark outrage in Japan and internationally. 20 millisieverts is the maximum recommended dose for adults during emergencies. The Japanese government’s decision to use that figure as a standard for children who will undergo their studies as usual has already led to the resignation of Special Advisor to the Cabinet Kosako Toshiso, a Tokyo University radiation expert, who has described the government’s decision as going against “humanism” and “international common sense”. 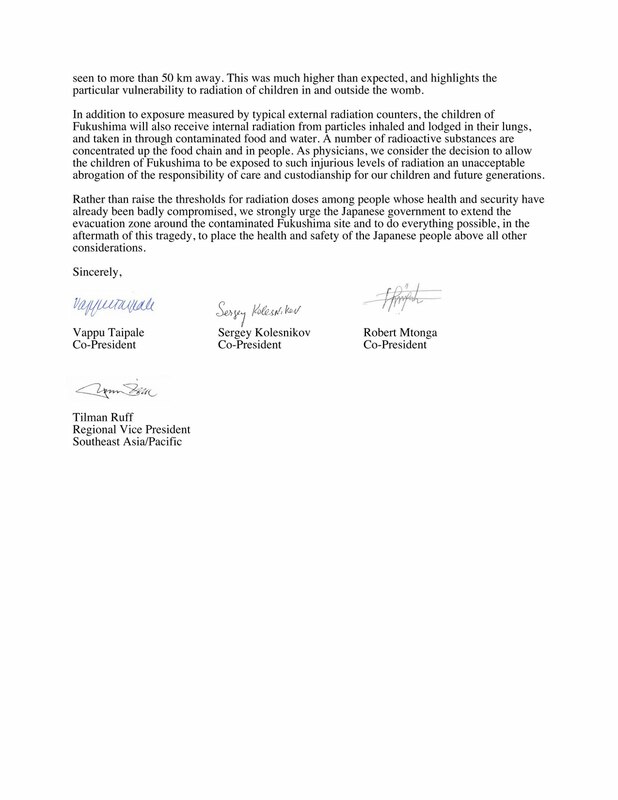 The US group Physicians for Social Responsibility have held a press conference describing the 20 millisieverts decision as “unconscionable”. 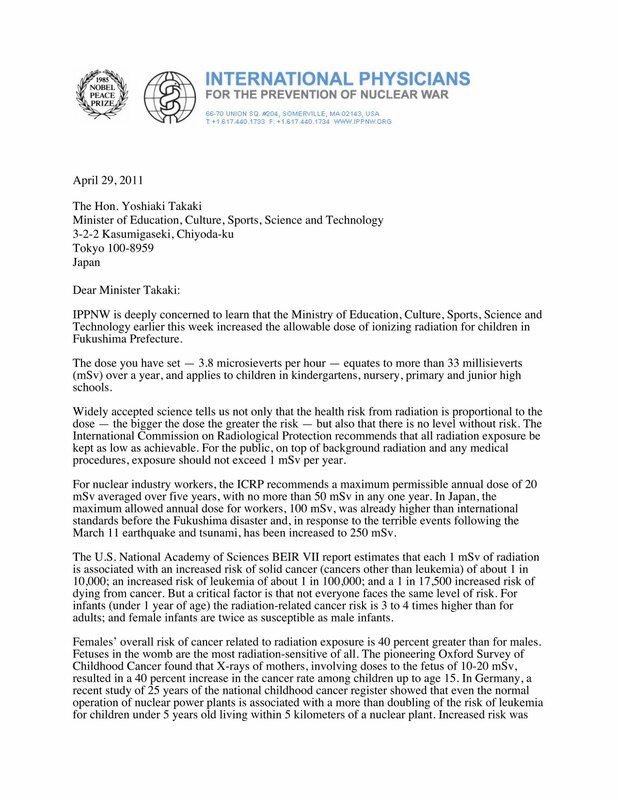 In Japan, a group of over a dozen influential doctors and scientists has sent a letter to Prime Minister Kan Naoto warning of the dangers of allowing sustained radiation exposure. They call for caution and a careful response to the Fukushima radiation release, pointing out that there are laws in place governing appropriate reactions to protect workers and the public in times of crisis. They note how a rate of exposure of 0.6 microsieverts hourly is high enough to demand emergency action. In mid April, areas outside of the Japanese government’s 30 km evacuation radius such as Namie-machi to the northwest of Fukushima Daiichi saw an hourly rate of 25.3 microsieverts, or over 40 times the emergency level. In areas like this one, they warn, pregnant women and young children are at particularly high risk. On May 7, a protest was held in front of NHK Headquarters in Shibuya to call for an end to Japan’s reliance on nuclear power and bring more attention to the issue of the exposure of children to radiation. Reports indicate that as many as 10,000 took to the streets. Click here for videos and photos of the event. Prime Minister Kan has pressed for the temporary shutdown of the Hamaoka nuclear power facility – a Shizuoku power plant ever closer to the ocean then Fukushima Daiichi – but demonstrators go further, demanding the shutdown of all nuclear plants in Japan. The march included several DJs on sound trucks and reports indicate that families and young people who found out about the protest online made up a large part of the turnout.